Hello everyone - please make a note in your records that our address has changed. The new details are included below. We have also released a new and improved Contract Sign-Off widget with enhanced functionality. There is a snapshot video available that outlines the new functionality and access information is also included below. 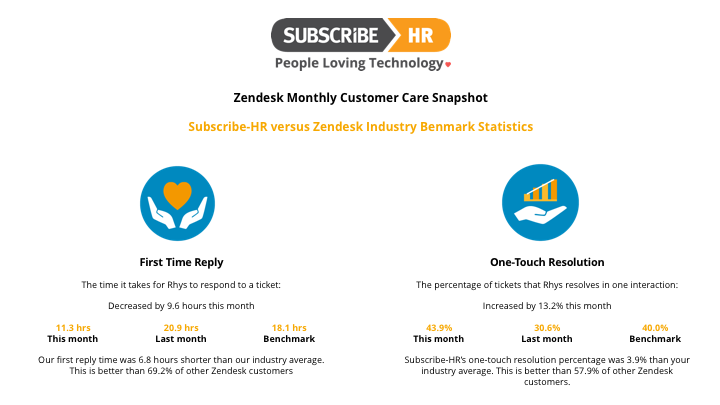 Milestone quarter: 6 new customers sign with Subscribe-HR. Wellness at work, simple habits for a happy workplace - How random acts of kindness can improve your wellbeing, including strengthening your immune system. New address - please update your records. Reminder: Pi (π) Talent Management Webinars and complimentary Review Form set-up. We are very excited to announce that since the beginning of the new financial year we have been experiencing significant growth and have now signed 6 new customers. We would like to take this opportunity to welcome all our new customers to Subscribe-HR. Each of these partners have introduced us to a range of new opportunities and we will keep you informed of those developments as they unfold. Congratulations to Jessica Banks, Ali Crowe and Paige Tracey from kikki.K. These three lovely ladies were recently involved in helping us complete a portal migration for kikki.K. All of them worked together to ensure that we had everything we needed to complete the migration in a very short turn-around time of only 5 days. They were extremely professional, organised and pro-active. Thank you kikki.K! In September, we continue with another monthly Wellness Habit. This month we look at how practising random acts of kindness can influence and improve your wellbeing, including improving your immune system. You can access this month's Wellness Habit by clicking here. 4. New releases: Contract Sign-Off. On October 10th, a new Contract Sign-Off release will be available in the Subscribe-HR system. The Contract Sign-Off App will be updated with new functionality added to enhance and streamline your contract sign-off process. Simplified generation and distribution of contracts. On the fly merge fields with the ability to edit at the point of contract generation. Support for multiple signing areas within contracts. Improved previewing and contract visibility before sending. During the month of October we will be hosting free Webinars that will give you a step-by-step demonstration of the functionality of the new Pi (π) Talent Management solution. Mission set-up and communication cascade. Strategy set-up and communication cascade. Individual and Group Review Reporting. Succession and Project Based including Flight Risks. If you participate in a Webinar, we are offering you the opportunity to have your Performance Review process set-up in Subscribe-HR as a complimentary service. This will also include a complimentary 1-to-1 training session to demonstrate how the solution works with your very own Review Form and process. To register, simply click on the button below and you will be taken to a registration page where you can choose and date and time that is convenient for you. Please note that each Webinar is limited to a maximum of 10 people. The webinar will be recorded and saved in the Customer Training video section of the website in early November so that you can access it on demand.